This episode is a favorite among many Star Trek fans and some consider it to be the best episode, for similar reasons as to why Mirror, Mirror is considered a favorite on the TOS series. Some of these reasons are merely cosmetics: the lighting and set design was consciously & creatively altered to fit the mood of an alternate Enterprise, one geared towards a long war - the Enterprise is portrayed as a warship during most of the episode. There was also an extra effort involved in other areas, such as depicting the bridge of the Enterprise-C (yes, yet ANOTHER Enterprise) and the excellent guest roles. In the plot, Enterprise-D encounters one of those time rifts, which looks like a gap in space. 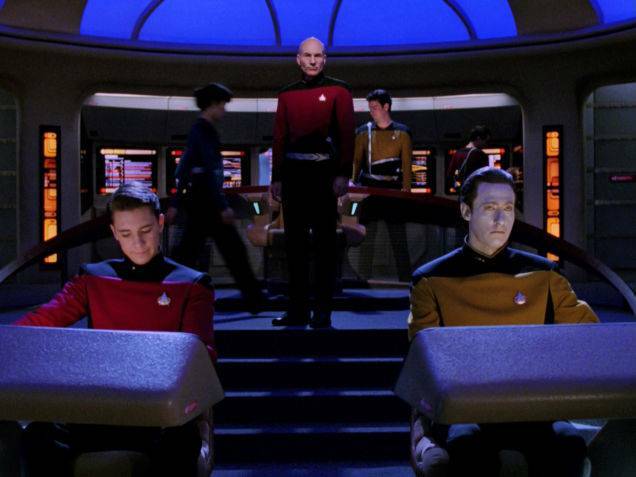 Through this gap, Enterprise-C suddenly appears, arriving in Picard's current time from 20 years earlier. The spin here is that, at the moment Enterprise-C enters current space, everything in current time changes. The past 20 years have now progressed differently because Enterprise-C disappeared 20 years ago. The Enterprise-D crew don't even know that things have changed - as far as they know, it has always been this way: they have been engaged in a 20-year long war with the Klingon Empire. 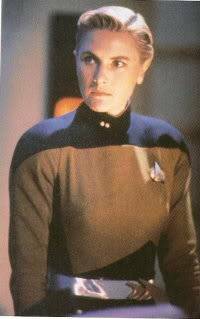 Instead of Lt. Worf, Tasha Yar (Denise Crosby) is now in charge of tactical on the bridge, as if she's always been there (in the 'other' reality - the one we're familiar with - Yar was killed a couple of years earlier). 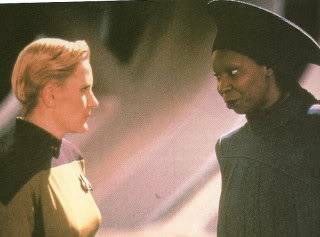 However, one person does realize that things are 'wrong' - Guinan (Whoopi Goldberg), who has perceptions beyond normal humans, knows that everything has changed. There are a pair of very good guest performances here, besides Goldberg & Crosby. 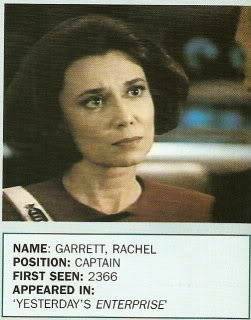 Tricia O'Neill plays the captain of Enterprise-C, an early version of a female starship captain. She projects a quiet, determined strength and is impressive. 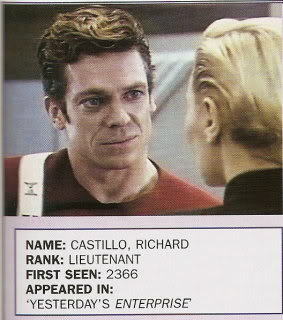 Chris McDonald is the first officer of Enterprise-C; he went on to many film roles and is an excellent character actor. His character begins a relationship with Yar. 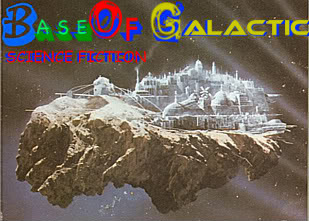 Finally, this climaxes with one those impressive space battles, as the Enterprises are attacked by 3 Klingon warships. One might say, this episode had a bit of everything. 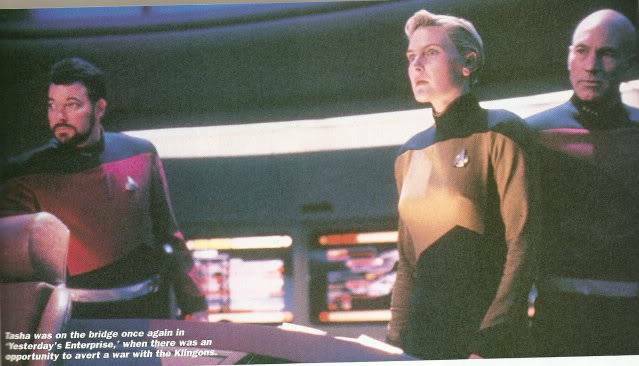 TNG Trivia: the ending of this episode caused even more temporal paradoxes for the future, in future episodes: Tasha Yar elects to go back in time with Enterprise-C; her daughter shows up in the 2-part episode, Redemption, in the 2nd part, at the start of the 5th season. 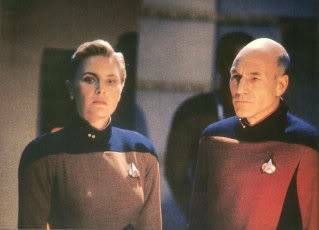 Her name was Sela and she was also played by Denise Crosby.